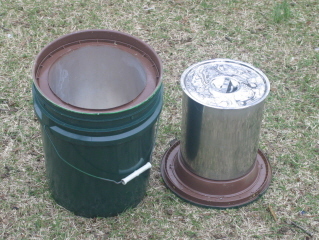 The “Green Pail”/“Hot Bucket” Retained Heat Cooker. Biomass cooking stove burns wood to charcoal and saves the charcoal. One pound of wood cooks 6 kilos of rice and makes 65 grams of char. Here is another 3 min video of the Hybrid Stove burning bamboo chips and pan cooking eggs. Bamboo chips burns well in the Side Supply Burner but the pan only reached medium heat. The heat from the burner seems to be diffusing and bypassing the pan. Enough heat is being generated by the burner but the pan module lacks focus. Suggestions to fix pan module? 7.5 liters of boiling pinto beans sits on the insulated lid.